"Good can exist without evil, whereas evil cannot exist without good. " The Downstate level of the 2013 Knights of Columbus Free Throw Championship was held Saturday March 9th at St Gregory the Great Parish in Harrison, NY. Contestants at the downstate level competition were the winners of their respective local, district, and conference competitions. 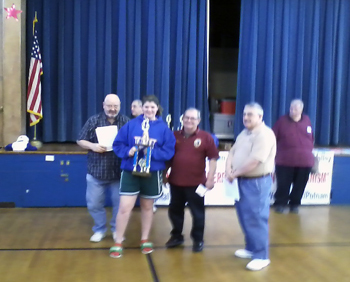 Danielle Deoul of Washingtonville won 13-year-old girls' division and Brian Picone of Washingtonville won 14-year-old boys' division. The members of Our Lady of Lourdes Council wishes to extend their congratulations to Danielle and Brian on their achievements. We also wish them success at The State Free Throw Championship to be held noon Saturday, April 27th at West Point. The Knights of Columbus Free Throw Championship is sponsored annually, with winners progressing through local, district, and state level competitions. International champions are announced by the K of C international headquarters based on scores from the state level competitions. All boys and girls 10 to 14 years old are eligible to participate and will compete in their respective age divisions. Last year more than 120,000 sharpshooters participated in 3,600 local competitions. The Knights of Columbus is an international, Catholic, family, fraternal, service organization with nearly 1.8 million members in more than 14,000 local councils. Last year, Knights donated 70 million volunteer hours and $150 million to charitable and benevolent causes, sponsoring programs to benefit their Church, councils, communities, family, and youth.